Mr de Souza said the PAP team has been walking the ground in the constituency and has visited each unit 'four to five times'. I understand that very well. He has been to my block about two or three times, not four to five times. Only once I opened my door to him. The rest of the time I refused to see him. I have since checked with several of my neighbors who had given him the same treatment. It takes very little time to walk through my block and so he can do it more than once. He never figured out whey we do not want to see him. For me, seeing him once was more than enough. It was an unforgettable experience. I can't verify that he has been visiting 'four to five times'. It just sounded exaggerated to me. Just came back from visiting the HBT facebook page. Nice to see CDS has his fans. That's only reasonable or he would be in big trouble not now, but long ago. If he comes by again, I will see if he only bring minority race with him and if I had to stand at the door and wait for him. As I said before, if he is truly humble, there wouldn't be any scripted bahavior, e.g., don't have an advance party, but use a left behind party, i.e., knock on our doors first and go and then come back. If your PM styled you guys as servants then don't expect us to wait for you like some Chinese Mandarin. Received this in my email early this morning from a friend in Canada. They are also having elections and this was her comment. They may be disillusioned, and I feel sad for them. Will politics in Singapore become something like this some day? Well, we shouldn't worry about it but keep it in the forefront of minds. I am sure everyone wants a first world parliament, but given what human nature is, would it turn out to be just fantasy? May be we can achieve it, perhaps we can only enjoy it briefly. The historical record do not inspire confidence. Even if history doesn't repeat itself, it never fails to rhyme. The vote is on Monday so the three main candidates have been battling non stop for the past few weeks. I'm sick & tired of it all and the same applies to the majority. The sad thing is people are so disallusioned that they are refusing to go out & vote. Also, elections Canada has made a mess of the polling station areas and they are sending some of us too far away from our district to vote. Oh, it all gives me the headache. Good luck with your elections! OK, say come May 8, we have no opposition in parliament. The government will create an emasculated one. To the PAP, that is the only safe opposition we can afford. I imagine lots of people are unhappy. OK, let's imagine they are not the majority or we would have many opposition MPs voted in right? However they are far more vocal than the majority and by and large brighter too. What then? The longer historical record on non-democratic governance is even worse :-( More of our best and brightest make plans to emigrate. Filling the holes they leave behind are new immigrants that are economically useful but socially and politically useless. Thumbs down for Singapore. The verdict of history for governments is not encouraging at all. What shall we do? I think we must resist history. If we acquiesce to it, we only have ourselves to blame if our children relive its bottom. To live in fear is not to live at all. We must be courageous but we must distinguish our thinking and action between wisdom and foolhardiness. Definitely we are foolish if we allow fear to run our lives. We are also unwise if we assume humankind would always act in his best self interest, a lesson Alan Greenspan had learnt the hard way. No, we must encourage each other to living up to the highest ideals of humankind but also buy insurance by assuming the worst is possible and view it as preordained given enough time. Today, we have an infrastructure not available to earlier generations that can support our social evolution - The Internet. We have to use it to provide as much transparency in the corridors of power as possible. It is always in darkness where nefarious schemes to defraud the people are hatched. Transparency increase our chances of success remarkably. 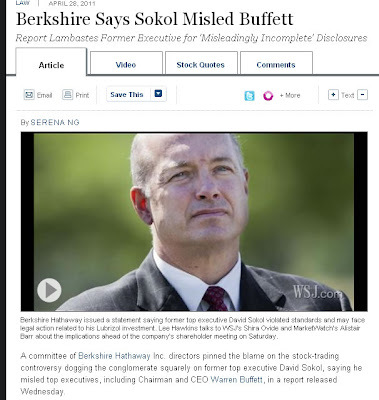 Without transparency there is no accountability. I cannot accept PAP suggestion that we just trust them. So we sit around for inevitable corruption to over take them? Foreign investors and governments often praising our government to the high heavens see at most five to ten years into the future, but as citizens we calculate into the lifetimes of our children. No wonder they are not worried but we are very. I hope it last a generation at least, but our experiment could turn out to be short-lived; we cannot be absolutely sure. We will still decline and perhaps disappear from causes we cannot yet imagine. But as we perish sometime, let's not go down for the same reasons previous civilizations disappeared. We should be satisfied we are leaving a new record for posterity to guard against because we have pushed further the frontier of how to organize society, the political-economy. When I read Revelation in the Bible, I have no reason to feel optimistic about Earth's future, but I also feel I might have been too presumptuous to think I have understood what I have read. I am not going to let it poison me. The leading religious authorities of the day could not understand God incarnate was coming. Far away, three wise-men had better understanding. Obscure, with no credentials Simeon and Anna was privileged to see the Christ before they die. Chances are we are all misreading Revelation and the other prophetic passages. I am not going to let religion work against me here. That would be stupid. When the time is right, we shall understand those mysterious scriptures. At this moment we can only act with the knowledge and insight we have. We shall always ultimately have to say, "In God we Trust" but we will not let the PAP continue with, "All else please use Cash". Well the SDP is not offering themselves to us to create a First World Parliament. To me they have put the cart before the horse. How I wished the WP was contesting here. 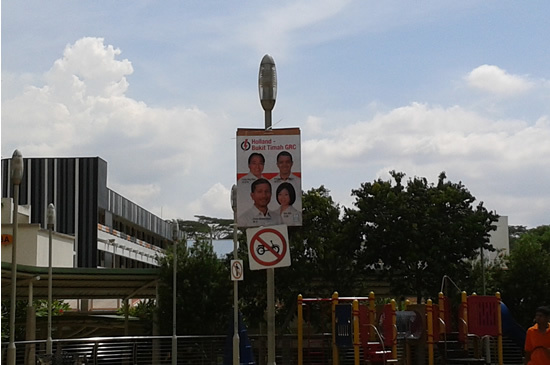 I will have to wait another five years, but only if this round they win Aljunied GRC. So much is at stake here. How did the PAP Jedis turn themselves into the Sith Lords. They are still deluding themselves as Jedis. Lee Kuan Yew has also turned to the Dark Side because he had allowed fear to enter and control him. Looks like the modem/router I got recently wasn't good enough. 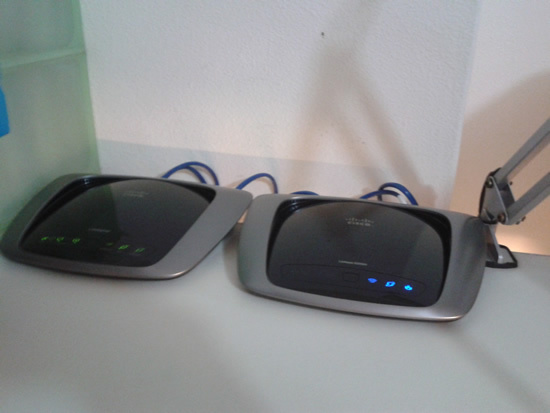 Ended up buying a new Wireless N router by Linksys (E2000) and now performance has gone up. My place isn't that big. I was surprised that I need this. Perhaps I can change some setting tomorrow to make it even better. Don't they look like siblings? They are destined to be together! Against many years of observing human nature, the writer is idealistic. Now if we have enough people like him, if we have the courage, let's go for it! To me, this is the basis of a first world parliament. I hope this is what the WP thinks too or we are in trouble. The problem is finding enough men and women to defend and protect these ideals. Let's grow from protecting our homes to our way of life and to our ideals. Because the PAP is so cynical of human nature, we are stuck with defending our homes. Sadly in time all of us will discover the hard way that we do not live by bread alone. We will hollow out because we lack the foundation to build a sustainable society. Thank you PAP for taking us up till here. It does not seem that as long as you place your party narrow interest ahead of the nation, you are able to help us go much further. It is sad to see how you are daily riddled with fear rather than faith in tomorrow. That fear which possess you had infected us for too long. No wonder we are unconsciously not reproducing ourselves, which is the slow suicide of a society when defaulting to fear. Keep in mind Ngiam Tong Dow's sagely reminder that the nation is greater than the party. We are so pathetic because we are too afraid to grow up. Gen Y, not having had the experience to grow in fear are leading the charge into the future today. Kudos to them. Make the date! July 1, 2011. At this time of writing, I wonder what government would we be living under at that time. Most people are as usual too presumptuous. What if there is a freak elections result however remote the possibility. Well, we have to grow up. 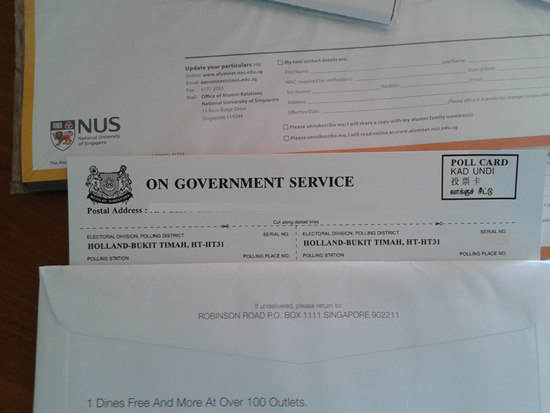 Picked up the poll cards from the letter box this morning. Lots of other mail. Can't remember when I last opened the letter box! Keep thinking how I should cast my vote. Spoke to some neighbors earlier. In their family they are divided among themselves. 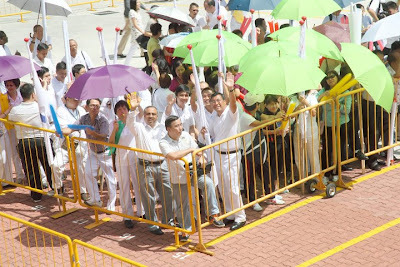 According to them, the older folks would still support the PAP. I accept theirs is a lifelong bond. The PAP had failed to forge a similar bond with the rest of us. They could have reinvented government long ago when they started losing people from the community centres. Imagine how grateful my parents' generation world to be able to pop up at the community centres to watch TV. These days, you can have more than one TV to yourself. In fact, you rather have a computer. Instead of chasing us they tried to reinvent the community centres. At best they could only retard the trend. They have no means of connecting with us emotionally. Like teenagers, we grow up and become distant from our parents. Their big mistake is to go into denial thinking that the bond still exists. So the kids had a feel what an elections rally is like. Now I am doing the leg work of putting together some memorable ones for them to study. I shall skip the PAP ones. We are so familiar with those, they are even required study for social studies in school. First to go because we are in this constituency. Dr. Vincent Wijeysingha from last night rally. Next because I found this first before the others...I am still searching, this one by Sylvia Lim of WP. I wished their reps were standing here. The choice would have been a no brainer. And here is Chen Show Mao, more cerebral and less emotional as he is a very serious man after all. Now the speech by Nicole Seah, a must for young listeners. I appreciate (that show respect) he has addressed the PM as PM Lee instead of Mr. Lee. Low Thia Khiang. He is important because he is the substantial leader of the WP. Clearly a guy who loves talent in others more than in himself. Can't find the speeches from Chiam See Tong, Benjamin Pwee etc., Add them later. Family outing tonight. 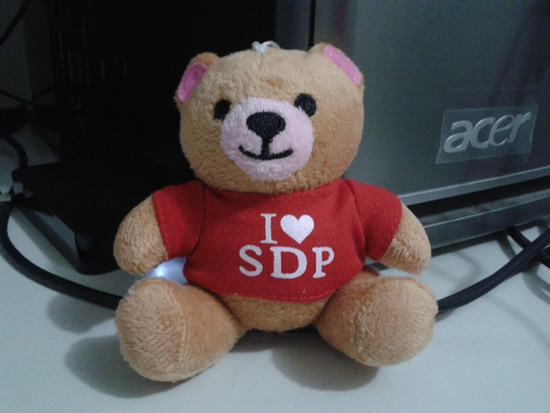 All of us went to the SDP rally. We left the car at home and took the bus and were surprised to meet a few neighbors at the bus stop! The photo above was taken from Commonwealth station. You can see the red tents where the SDP sells souvenirs to raise funds. Business wasn't too bad. We bought a couple of bears for the kids. Here is the bear, quite cute if politically incorrect. I don't think the girls will be taking them out in public. Perhaps we shouldn't have such feelings. A growing number of people are abandoning it.Well the truer reason is we do not want to identify with their merchandise yet. We are not sure about supporting them. If it were the Worker's Party, we are in. We didn't stay long. The trip was to let the children have a feel of what a political rally is like. I suppose I can catch up on the speeches on YouTube later? Hope so. A friend sent me this. Hilarious! Let their videos talk. The incumbent first but if you have no patience then skip to the SDP one below because they are under resourced they had to keep it short and very low cost. And here is the one from SDP that is going viral. Emotional, no substance but you are likely to love it. As for the PAP, don't bother to get the link. Everyone of us have a hard copy of it in four languages. They also have countless vehicles with loud hailers to wake you up from your siesta crying to you to vote for them. Voting is serious business. I will think over carefully before making my choice. One thing is sure, I don't like my MP and his Minister. Why his boss likes them, I don't understand. How can I ever understand? They are so opaque. So don't believe everything in the PAP's video. We lived it we know. Come on, I have a daughter with learning disability. They promised something on that. Not true! As for SDP, there is nothing to believe. Just note that the PAP dirtied the place and the SDP picked up after them. I guess their little gesture of living their slogan, "We love Singapore"
"Singapore got poor people meh?" Daft question. You must be in prison for a long time not to know. Unless they have added caning to to your sentence, that might be a better place to be safe your pride and reputation! Thanks to Paul Soon, he posted this video on his FB page and I just borrowed it. I want this to be here for my daughters to view and remember. When I was a kid, poor and destitute people were very hard to find. When my parents were kids, there were many. May be in the circle of life, we are on the way to where be begun? Pray not! Every few weeks or at most, a couple of months you get a story like this. Someone who was very very carefully chosen, even anointed as a successor to a great leader or CEO and then he failed. 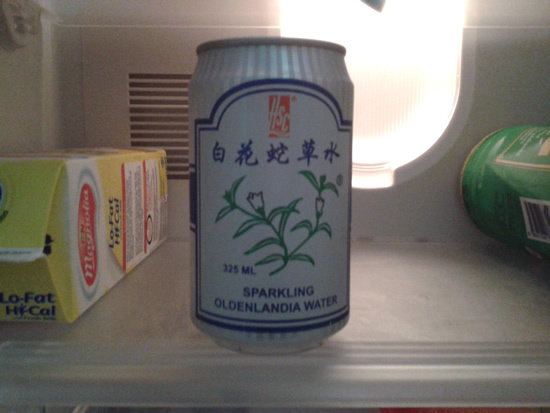 Sometimes the successor managed to take over e.g., as at Coca Cola when the legendary Goizuetta passed away. Happen to the best organizations all the time. Why should the PAP be an exception after Lee Kuan Yew aged 87 is passed from the scene. Think of him as Coke's Goizuetta. This morning PM Lee came clean with why Steve Tan had dropped out. That meticulous system they have for choosing candidates, they like us to think that even if it is not 100% is very very good. Without giving a number, they hope you would go away thinking that it is 90 or even 95% good. Well that system gave me a lousy MP and a doubtful Minister in my GRC. Another system called the GRC, ultimately an insult to us because it assumes we will never mature might cause us to lose some very good ministers. Any system that seeks to protect always also have the capacity to harm. We will all know if we lose George Yeo or the Worker's Party A team. One of them must lose right? Not a problem if we only had SMCs. I can't accept that Tin Pei Ling can ride on the coattails of SM Goh into parliament. And I hate to see the price for seeing Nicole Seah in parliament is for the SM, a former PM to be ousted. This is a stupid system. If the opposition isn't strong enough to do so, citizens ought to rise and pressure the PAP to dismantle the GRC system. Ensure minority representation via GRC? The country could lose its life trying to do that. Double stupid. Just a PAP conceited idea of trying to stay in power forever. It doesn't work and we will all be losers. I need to conclude with Steve Tan. I have thought too highly of the man as per my earlier post after reading his reasons for quiting the race this morning in the ST. That's another black mark on the PAP system of selecting candidates. Nature's system isn't perfect from man's point of view, but with its "mistakes" it also provides it own means of self-correction. Those who are students of the Tao will understand this better than I do. 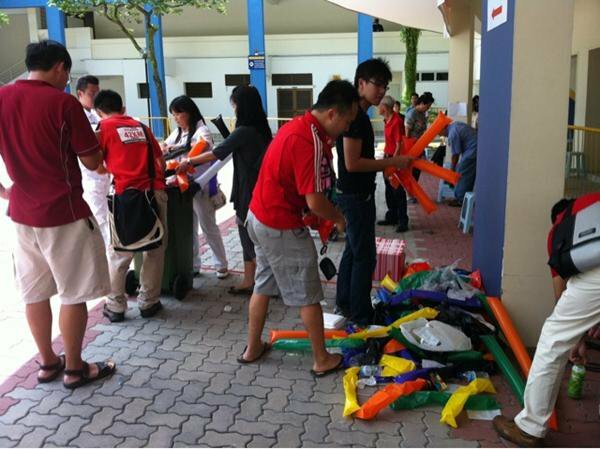 Really disgusted with the PAP supporters for Holland-Bukit Timah GRC etc., They dirty the place and then SDP cleaned up after them. Minister George Yeo asked the tough questions by Xiaxue, Don Richmond, Viola Tan (Love Bonito), and The Online Citizen. Hosted by Irene Ang. Topics include ministers' salaries, Tin Pei Ling, and jelly wrestling. Pity that it is him or the Worker's Party that will make it to parliament after polling day. He has been one of my favorite ministers. Thoroughly brilliant, I admire him from a distance. When I was living in Dubai and I needed help, I emailed my MP but he ignored me. I emailed George Yeo on Facebook and he responded within ten minutes and arranged for the consular department to help me. I have no doubt that if Aljunied GRC is broken into SMCs, George Yeo would win hands down and my MP concentrate more fully in his law career when we vote him out. Never imagined that the GRC system would make "life risky or even unfair". Many less needed or deserving MPs from the PAP might retain their seats but facing formidable and extraordinary opponents George Yeo might be out all because his GRC is a national proxy for our desire to see more check and balance in parliament. That's just life. So many things in life is just life! The nation ranks ahead of a GRC. Painful choice. I believe whichever side wins, this is one GRC where all of them are winners. Few contests are like this. I have been paying $5.95 for a pack of two for months now. If you buy this singly, it is $3.50. No brainer. PAP logistics power, but what is the use? I was at Ghim Moh market just now. Be astounded by PAP logistical might! But what is the use? You have got to win the hearts and mind of the people. Even in good times they only try to reach your mind. Do they think we are Lt. Cmdr Data? This is myopic. Can we deny our humanity? Stupid. Anyway of the four, Christopher De Souza and Vivian Balakrishnan, I am not supporting them. The other two, beyond their names, I hardly know them. If they fail to get into parliament, I will not be miss them. My vote doesn't count, it is just one vote but added with my neighbors, and I can't find a happy one, that could be a problem for them. Sure, they still might vote this team if only out of fear. Living in fear, that is not the way to live. If you are prepared to do that, you can be sure your kids will grow up and scare you by voting opposition. On this, I am very sure. The question I ask myself is really simple: Do I want the next five years to be like the last five years? Do I feel optimistic about the future of my children? Are these MPs and Ministers smarter than many of my friends and me? Oh, that is the wrong question. I know they are not smart enough for the global competition. They are just very good runners after trends. Their dog trick is to get us to run quickly and often stressing and tiring us out. The monkey trick is to get us to adapt and live where peoples elsewhere are mostly unwilling. If that is the level of intellectual leadership that they are capable of, thousands of Singaporeans can do their jobs. What we do not have and dearly need is an intellect like Dr. Goh Keng Swee. The one who doesn't follow trend by blaze a new path forward a decade ahead of everyone. If you are good, you do not need to explain. If you are bad, you do need to be there to explain. I adapted this from Adolf Hitler. Lucky for them, we are not little Hitlers. Unfortunately they think we are difficult and ingrates. I deleted my earlier post. I feel that it was too speculative and unnecessary. I don't want to remember it and so out it goes. Here is my more thoughtful response. My later thoughts of this event is this. The PAP very thorough, systematic and rigorous way of choosing people is in the end a weak system. I am not saying the PAP has been negligent here. Not at all. It is inherent in all man made system that we cannot hope to achieve a very high success rate at choosing the right people. The best way to throw up the right guy is Nature, definitely not man made. Just look at the dismal track record of men choosing men. How frequently countries and global corporations have failed to find successors that are at least even half equal to those they replace. Can you expect the PAP to do better. They can only try. No guarantees are possible. Steve Tan dropped out for personal reasons. That is a black box that cannot be opened to reveal the true reasons. I had speculated about it, and since I know nothing about him or even his friends or family, it was a waste of time, not worth blogging for remembering. My thoughts should dwell on how to choose the right men and women for political office. I think for GE 2011, the opposition had the advantage of choosing the right candidates even if they are woefully inadequate to form a government if they win by a landslide. Why? The PAP puts its candidates through tough "simulations". You know no pilots die in a simulator. The opposition is different. It has no capacity to use simulators to test their candidates. It is done the old fashioned way - gut feel. That's the Lim Kim San way. It is more reliable and Malcolm Galdwell had taken some pains and make it accessible to us in one of his books, "Blink". There is a surer way of throwing up the right people but no methods are fool proof: The cost of failure. In opposition politics, if you fail, you could crash and burn. There is no safety. You also might run the risk of getting sued, made a bankrupt. The testing in the furnace produces gold. It is a messy system, not measurable, very unscientific but the verdict of history is on its side. We are overly taken up with science where science have a limited contribution to make. The PAP bought into this because Nature refuses to serve their cause any more. Today many of the opposition candidates are not cartoon characters with nothing to lose. Many of them can easily make incomes more than the MP's allowance. Failure will cost them significantly, not just the $$$ but everything. They are willing to take the risk, face imagined or real consequences - we don't know. Perhaps the PAP will use the ISA on the opposition if they lose the elections. Anything can happen. You know what power does to men. That is a better way of seeking out the right candidates to run for political office. This is Nature way and it only appears once in a while. What do you think is the choice of History here? Definitely not a one-party system. I know, because I can observe which side Nature is taking in this GE. I can also sense Chen Show Mao knows this too. "imperfect as I am", "the people is the secret weapon". Those phrases belies the insight in the man. The less wise ones have gone to join the PAP. Perhaps the smartest among them is Steve Tan who had chosen to drop out. Now this is a blog entry I want to remember! I sense that many people want to teach the PAP a lesson for being so arrogant, dismissive and insensitive. Very few people want them to be voted out of government. However this academic possibility is no longer unrealistic. I sense this about a year ago when my old uncle, a stalwart PAP supporter told me at my late father's funeral how angry he was with the ruling party. My latest mental framework of what is happening, I have blogged for myself here. "To me, the situation now is quite alarming, I have never heard from so many people and of so many negative things about PAP and I wonder what will be the outcome of the G.E. In the early election years, I remember hearing lots of good comments on PAP and no doubt these vocal people were supporters of PAP, and the quiet ones tend to be supporters of the oppositions. Not sure this time round it is going to be the opposite….that means the vocal ones now will vote for the oppositions and the quiet ones vote for the PAP and more likely for personal reasons." MM once mentioned about his fear of a freak G.E. result, well I am having this fear now. People may no longer vote for who is better but simply just to see change because of their frustration with the arrogance of PAP. I am very sure lots of people do not want the next five years to be like the last five. If we keep them in government and if they think they are servants of the people, they don't realize they will make us dogs and mongrels. Nobody wants that. I can sense big changes coming. One of my ex-boss at Shell (of course must be long time ago lah), a place full of Pappies supporters sent me this. Incredible. His deputy used to even warn us youngsters not to upset the apple cart voting Opposition in the 90s. How the world has changed! Might as well have a good laugh. And I want to remember this moment. Of course MM thinks there will be tears and gnashing of teeth instead. I need your urgent advice about employing a maid. As a busy mother, I need someone reliable to help out at home. 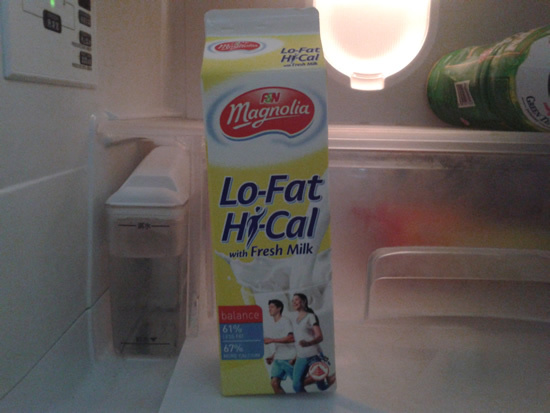 My maid is from Profits Agency Pte (PAP) and she has worked for me for a long time. Her mother worked for my parents and did an excellent job, so I had faith in her. For several years her performance has been very good, but recently she has become arrogant and insensitive, and is making lots of mistakes. 1) She flooded my kitchen – she told me that the drain pipe has blocked (she was supposed to clear it once a month but didn’t). Then she assured me that it is very rare (once in 50 yrs) and won’t happen again in the near future. Guess what? It flooded again within a year! 2) She didn’t close a window and my terrier dog escaped. I was so worried cos he is dangerous and could bite lots of people. After the incident, she didn’t apologise and just shrugged her shoulders saying “What to do, it has happened.” Fortunately my neighbor found the dog and we locked it up again. 3) Without consulting me, she has been bringing in strangers for my house's maintenance work. She says they charge low wages and keep costs down, but they eat my food, make a lot of noise and rest on my bed. I think they even tried to seduce my husband. It stopped feeling like my home, more like a cheap hotel, and I don’t always want to come back at the end of the day. 4) When she first came to work for me, I instructed her to clean the different parts of the house at least once a week. But for some time she has stopped taking care of the bedrooms of PP and H; they are now dirty and messy. I asked why and she told me that the kids had been disobedient, so she was neglecting their bedrooms as a punishment (she has forgotten that she is paid to clean all the rooms). Even though my maid has worked for me for many years and I value what she has done in the past, I think she is now getting complacent. Her attitude is imperious and dismissive. She ignores my comments and basically treats my feedback as "noise". I wrote to the agency about her behavior; they assured me that they are the best agency around and all their maids are “Commited to Serve” – but I think it is just rhetoric and I don’t see that in her actions. Her salary is much higher than maids in other countries, but the agency say this is to keep her honest and stop her moving to another employer. They say there is a limited supply of maids, and isn’t big enough for more than one good maid agency, so I should not trust their competitors. I have to decide whether to renew my maid’s 5-year employment contract. When we discussed this she said that she is now part of a team, and if I want her I must also accept her friends doing part-time work for me. One friend is very inexperienced, can't do basic tasks or explain what she intends to do. I suspect that she is actually underage. When interviewed, she only seemed interested in her days-off and visiting Universal Studios. When she couldn't answer my questions she stomped her foot and exclaimed, "I don't know what to say!" But I am still expected to pay her a high salary. Now there happens to be a few other maid agencies - Workhard Pte (WP), New Solutions Pte (NSP), Super Personnel Pte (SPP) and Star Domestica Pte (SDP) - that offered me some helpers who seem sincere, genuine and intelligent. They are keen to work, willing to assist me and have a good attitude. I know that they may take a bit of time to learn how everything works, but frankly I am inclined to give them a chance. People say that the devil you know is better than one you don’t. But I feel that I can’t tahan my current maid anymore. Do you think I should sack my current maid.? Should I listen to Lee Kuan Yew on how to vote? An intellectual foil against Lee Kuan Yew's advice on who to vote for. Thanks for the reminder Nassim Taleb. Those who seek to prevent volatility on the grounds that any and all bumps in the road must be avoided paradoxically increase the probability that a tail risk will cause a major explosion. Consider as a thought experiment a man placed in an artiﬁcially sterilized environment for a decade and then invited to take a ride on a crowded subway; he would be expected to die quickly. Likewise, preventing small forest ﬁres can cause larger forest ﬁres to become devastating. This property is shared by all complex systems. It is the system and its fragility, not events, that must be studied -- what physicists call "percolation theory," in which the properties of the terrain are studied rather than those of a single element of the terrain. As Jean-Jacques Rousseau put it, "A little bit of agitation gives motivation to the soul, and what really makes the species prosper is not peace so much as freedom." With freedom comes some unpredictable fluctuation. This is one of life's packages: there is no freedom without noise -- and no stability without volatility. Lee Kuan Yew probably got it wrong. As he cannot engage the world like he used to in more vigorous and rigorous fashion, he has basically been atrophying. Do not mistake sustained or new fire for a very bright after glow. The world is moving on. We must not be held back by him. The upheavals in the Middle East have much in common with the recent global financial crisis: both were plausible worst-case scenarios whose probability was dramatically underestimated. When policymakers try to suppress economic or political volatility, they only increase the risk of blowups. How else did I get to know this. Serendipity of course. My take? Feels like the PAP of my parents' time! but it is now called Workers' Party. Of course, the PAP will ask how we are going to pay for it? Good and valid question and we must find the answer and prove them wrong. Why? I don't want the next five years to be like the last five. Even if I were to belong to the elite, I would feel terrible leaving most of my fellow citizens behind. We must carry everyone along together like the young LKY and his team used to do. Time we learn to stretch ourselves and do the "impossible", like the PAP of yesterday. That PAP now is dying under LHL leadership and which LKY himself seems to have forgotten. 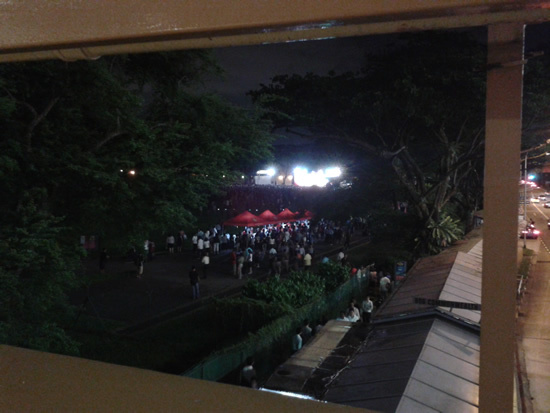 Real pity that the Workers' Party is beginning to steal the roots of the PAP. How could they let this happened? Next, good work from "Humble Opinion" on Facebook why the PAP is not good enough today. Condo apartment bought in 1987 = $275K. Today, the same condo apartment [mind you 99-year leasehold less 24 years] selling at $1.2M due to en-bloc fever. New condo apartment of the same size would cost $1.7M today. HUDC apartment with no amenities in 1987 = $270K, Executive Condo will full amenities today but much smaller = $700K. Salary of degreed factory Engineer with 3-year MNC experience in 1987 = $3.5K per month. Today, the same engineer gets about $4.0K per month. With inflation, it is a negative pay rise. 1000cc Japanese car bought in 1984 = $25.5K. Today = $60K with COE. Owner occupied semi-D [99-year leasehold] bought in 1999 = $1.16M, today same house worth $2.3M. Forget about asset enhancement, it is owner occupied. Sell and migrate... in order to cash out? Young Singaporeans can hardly own landed properties on their own. If this is First World living standard with Third World wages, we should stop and rethink the whole transformation plan for Singapore. Our kids' generation are in a fix - it is very expensive for them to live here in Singapore with such exorbitant cost of living... their standard of living has dropped significantly. No wonder they do not plan to get married that soon and do not want to have more than 1 child. We may have a strong foundation but our fundamentals are weak. A friend wrote me the following this morning. In plain terms, Vincent Wijeysingha is [redacted] . Mr Tan JS and Dr Ang YG both are staunch Christians. They don't or shouldn't mix. That is Vivian's innuendo. We're going into personal sexual orientation and religious belief. What's next? Dr Vivian Balakrishnan yesterday described the Singapore Democratic Party (SDP) team running against him as ‘strange bedfellows’ who do not have a shared vision or ideology. He declined to give more details about the clip. ‘I suspect Mr Tan had not done appropriate due diligence of his teammates and his party,’ he said. Here was my response to my friend knowing that Vivian Balakrishnan was a Christian and also married the Pastor's daughter. Before Jesus mixed freely with tax collectors and prostitutes nobody, not even the most saintly, not even his cousin John the Baptist, not even the farseeing and privileged Simeon or Anna who had been given the opportunity to see him as a baby. None, absolutely no one would imagine him partying with sinners. Equally unthinkable was the washing of his disciples' feet. Most of us are spiritually not open to him. Actually he continues to shock. He does it everyday but only a few examples make it to the global media. Of course the most prominent one being Mother Teresa. Therefore who are we to judge? If you must judge, let your love, forgiveness and grace be greater than your judgement. When we appreciate better (we are incapable of grasping it fully) all these, you will discover you have no mood to judge. Only He can judge but for now he chooses not to but prefer to be like the father in the story of the Prodigal Son standing at the door to wait for our return. Yes, there will be judgement, but not now and certainly not by us or Vivian Balakrishnan. Each of us must be careful not to go over to become sons of the Pharisees and religious teachers of Jesus day! And in case the point is missed, I would like to add this story on what it means to be Christian. Forget about the intolerance and nonsense of the religious right in America. Their stand against abortions, gays and their strange love the sinner but hate the sin which is so confusing. Here below is an experession of the Gospel. down the aisle looking for a seat. really looking a bit uncomfortable, but no one says anything. there are no seats, he just squats down right on the carpet. church, a deacon is slowly making his way toward Bill. themselves that you can't blame him for what he's going to do. college kid on the floor? It takes a long time for the man to reach the boy. can't even preach the sermon until the deacon does what he has to do. him so he won't be alone. will never remember. What you have just seen, you will never forget." Minister Vivian Balakrishnan you ought to have taken SM Goh's advice. The story about you in the New Paper is bad enough, you don't need this. I mean the part where you were floored by a grassroots leader who gave up spending time with is critically ill with Leukemia wife to help you win this elections. As their leader you aren't even well informed of their family circumstances. You could be more caring and interested about their lives you know. Just be careful what you say, it might only make you look worse.